Learn how to knit with free knitting videos! Grab your knitting needles and yarn, and learn a new knitting skill the easy way: by watching! Start by learning the knitting basics such as Long Tail cast-on and the knit and purl stitches. Those three techniques make up the vast majority of any knitting project, so pat yourself on the back. From there you'll probably want to learn a couple of increases and decreases, and check out our knitting tips page. To finish your project, you'll need to learn how to bind-off. When you're ready for even more excitement, delve into some advanced knitting techniques. If you get stuck along the way or just want to chat with other knitters, drop by our friendly online knitting forum. And if you're looking for your next knitting project, come browse our free knitting patterns directory. Grab your knitting needles and yarn and get ready to learn how to knit! How to Knit: A complete introduction for beginners is a step-by-step tutorial for new knitters to follow along and learn to knit. 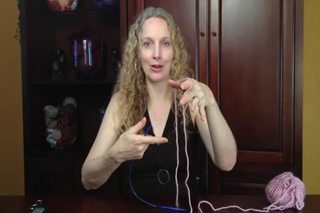 The complete video is 45 minutes long and jam packed with knitting know-how for the new knitter. Ready to Learn More Knitting?